Provide comfort for the family of Maria Gargano with a meaningful gesture of sympathy. 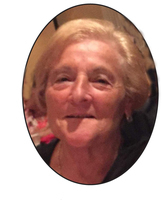 It is with great sadness we announce the passing of Josephine Gargano on January 30 at Sunnybrook Health Sciences Centre. This amazing matriarch gave it a good fight, but in the end our God needed her. Josephine will be profoundly missed by Armando her loving husband of 62 years, daughters Nadia, Leda (Joe), Claudia, grandchildren Adam (Shannon), Nicole (Brian), Martine (Tim), Julian (Amanda) and Connor, great-grandson Owen, and great-grand-dogs Tucker, Phoebe, Phonix and Murphy. Visitation at Marshall Funeral Home (10366 Yong Street, Richmond Hill, 905-884-1062) Sunday, February 3 from 6-9 pm and Monday, February 4 2-4 pm & 6-9 pm. A funeral Mass will be held on Tuesday, February 5 at St. Luke’s Catholic Church, 39 Green Lane, Thornhill at 10:30 a.m. Entombment Holy Cross Cemetery. The family asks that donations to The Odette Cancer Centre be made in lieu of flowers. Consider providing a gift of comfort for the family of Maria Gargano by sending flowers. I am deeply sorry for your loss. May the god of comfort be with your family during this time. Revelation 21: 3 and 4 foretells of a future time when death will be no more and we will be reunited with our loved ones.Your family will be in my prayers. Our thoughts and prayers for our dear cousin Josephine and her family. We are so sorry for your loss. She was a kind hearted woman who will be remembered dearly.